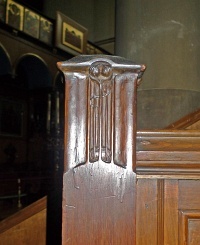 Authorship: There is stylistic evidence to suggest that Mackintosh contributed at least to the 1898 woodwork. The Gothic surround to the choir passage door installed at this time has a distinctive arched top in the form of a flattened ogee. This has parallels in a number of his furniture designs, and the blind tracery in the gable includes unusual horizontal ovals of the type he later used in the window tracery at Queen's Cross Church, and in the chancel woodwork at Bridge of Allan Church. Alternative names: Belhaven United Presbyterian Church, Belhaven United Free Church, St Luke's Greek Orthodox Cathedral. 1: George Eyre-Todd, Who's Who in Glasgow in 1909, Glasgow: Gowans & Gray, 1909, p. 65. 2: The Hunterian, University of Glasgow: GLAHA 52344 (M028-003). The date traced from the original drawing is 8 November 1898. The tracery design executed is far simpler than what is shown in Harrison's tracing. 3: The Hunterian, University of Glasgow: GLAHA 52332.